Read the story of Operation Galia from Monty Halls's new book Escaping Hitler. 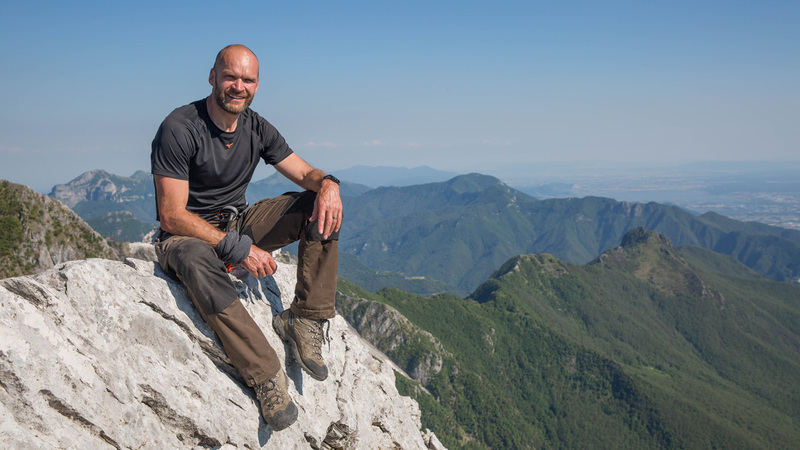 In his new book, Escaping Hitler, Monty Halls retraces the extraordinary journeys taken by people along the 'Freedom Trails' as they escaped from Nazi Germany, sharing the collective stories of tens of thousands of men and women who escaped. Read the story of Operation Galia below. Operation Galia was the second and most successful of three SAS actions carried out in the Rossano region between late 1944 and the end of the war. The mission was essentially to disrupt any planned German counter-attack on the port city of Livorno, which was defended only by the US Army’s African-American 92nd Infantry Division, and to tie up German manpower while the Allies rallied. By pulling German forces away from the Green Line, it was also hoped that this diversion would create a window of opportunity for a larger scale Allied assault. Gordon Lett first heard about Galia – though such an operation had been long hoped for and half expected – from a message received on a radio borrowed from a nearby American mission, during an encounter with its members on 22 December 1944. Lett had for some time been asking London for a military mission in the region, with a request for three to four hundred troops to exploit the gains he had already made with his own force. So the news of support was most welcome. The receipt of the message was even more significant since Lett’s own radio had broken down and he’d been out of contact with Allied command for some time. Unbeknownst to him, this absence of communication had raised suspicions among the intelligence community back in London that he may have been compromised, although of course this was not passed on in any transmissions. The signal informed Lett that a unit of thirty-three men from 2nd Regiment SAS, were to be dropped into his area five days later, on 27 December. An immediate response was required to let command know that he’d be ready to receive them. Almost in tears with relief, Lett replied: ‘. . . ready to receive twenty seventh repeat twenty seventh stop signal letter H for Harry repeat H for Harry and British and Italian flags on field already indicated stop regards’. It is worth noting here that Lett had been operating alone for many months, behind enemy lines, creating a fighting force from a disparate group of men using weapons he had acquired through initiative and carefully cultivated local sources, all the while trying to persuade the Allies that his organization was legitimate, and his need for support absolutely critical. He had also been walking a fine line with the local politics of the various armed gangs, partisan groups and key figures in the valley. Added to this, of course, was the constant threat of betrayal, and the fact that he was actively engaged in taking the fight to the Germans. Lett had somehow managed to pull this off, a feat of great diplomacy, of magnificent leadership, and of highly complex management. But with this must have come immense mental stress. Lett should be lauded as a remarkable figure in this period, this region, and this conflict, and his reaction on hearing that he was finally to receive tangible outside support is entirely understandable. The relief must have been immense. As it happened, 27 December marked the first anniversary of the first rastrellamento [SS Search] in the valley, and Lett knew that the arrival of the SAS on that day would massively boost local morale and possibly galvanize the various partisan groups into some kind of collaboration, however temporary. The force Allied Command was sending was only a tenth of the size Lett had requested earlier – but it was based on sound military thinking. It was extremely well trained, well equipped, and ideal for conducting guerrilla operations. Lett hoped it would have an immediate effect on his own force, and the population they relied on – and indeed who relied on them – so heavily. Formed in July 1941 by a twenty-four-year-old visionary called David Stirling for operations in the desert of North Africa, the soldiers of the SAS had quickly established themselves as experts in sabotage, hit-and-run raids and long-distance patrolling. Their recruitment strategy and training methods were initially somewhat Corinthian – many of their assets had to be ‘acquired’ from whatever local sources were available, an early characteristic that came to define them as eternally resourceful, determined and flexible troops. After some initial setbacks – on their first major raid they lost a third of their force, and inflicted no damage upon the enemy – they soon developed a standard protocol for training and operations that served as a highly effec­tive template for operations much further afield. By 1944, they were superbly trained, extremely fit and battle hardened. Lett could not have hoped for a better force to operate with him in the valleys and ridges of Rossano. On the morning of 27 December, Lett and his men set about preparing the DZ (drop zone) – a field above the now-ruined village of Chiesa. The local women had made large national flags out of coloured parachute silks sewn together, and these were sited at one end of the field. In its centre, other pieces were laid out to make a large letter H. They waited nervously all day. At last, late in the afternoon, they heard the longed-for sound of aeroplane engines, and six Dakotas flew into view. Operation Galia had arrived. In this book, which accompanies his new series WWII's Great Escapes, Monty Halls combines new research, accounts from surviors and his own experience of retracing the Freedom Trails, sharing the stories of those who did so for survival during the Nazi regime. Featuring stories of extraordinary heroism, feats of endurance and tales of spies and traitors Escaping Hitler offers a fascinating insight into the largest successful Allied escape of the Second World War.